Much like the foosball table was the harbinger of doom during the dot.com era, the storage unit foreshadows the danger lurking on the other side of those macrame plant holders. Now give me a minute of time and I think you’ll come around to my way of thinking here. I’ll also play the “that was the way I used to be” card so that I can make fun of storage unit lessee’s without fear of reproach. At least that’s how I’m justifying it. What does it say about you that you will pay someone 50, 100 or even 250 dollars for the privilege of storing your crap. In fact the amount of storage space in the United States is in the billions of square feet. That’s a staggering number all leading to the same conclusion. We are hiding our problems. Yeah that’s right. I don’t want to deal with the emotional baggage of dealing with crazy Uncle Ivan’s estate so I’ll shove it in a storage unit. I can’t possibly scale down my beanie baby collection so I’ll get a storage unit to preserve them. Oh no I can’t part with my collection of civil war chess sets those will be worth millions some day. No they won’t. They’ll sit there for ever, sucking money from your checking account every month and will be your kids problem someday. This behavior can very easily transition into your personal finances. The Home Equity Loan or the more insidious debt consolidation loan are the storage units of the finance world. I can’t deal with all of these various credit cards that I opened and used so I’ll lump them all into this home equity loan which is much more manageable. My crap is safely encapsulated in one monthly payment to be forgotten in a few months as it’s automatically debited from your checking account. Give it a year and you’ll never remember why you have a $35,000 loan in the first place. It’s now part of your “housing.” Better yet, now that you have that taken care of all your credit card balances are reset and you can start over in an infinite cycle. It’s time to put some labels on things figuratively and literally in the case of a storage unit. Take a moment and think about what lives in your storage unit or your home equity loan. Think about the cost of maintaining that “stuff.” Then get angry and get rid of it. Craigslist, donation, your friends and family are all good recipients of your excess junk. In the case of your second mortgage or loans, attack them with reckless abandon and move on. I’m not applying a global statement here, I’m trying to make a point. There are legitimate uses for storage units no doubt. People need a place to put their stuff when the move, or change jobs, or have short term assignments, I get it. But I’ll wager the overwhelming majority of storage units are filled with the stuff of broken dreams and promises. As I stated I’m guilty of both transgressions. I have had multiple storage units and several second mortgages. My current second mortgage contains many refinance fees and a whole bunch of consolidation that I can’t even begin to identify. It would require a full time forensic accountant to reverse engineer that train wreck. But to prove my own point here is some of the stuff I’ve had in a storage unit. I’m as guilty as the next person and this doesn’t even begin to touch the crap I’ve stored. That reminds me I’ve got some stuff to sell. What are you hiding in storage? When Does Saving Turn To Hoarding? I laughed out loud when I read ‘easter baskets’. We don’t pay for a storage unit, but we have a basement that is overflowing with crap, clutter, stuff, you name it, it’s down there. I am trying to go through it, but I don’t even know where to begin. .-= [email protected] Balance Sheet´s last blog ..Your Garden Harvest: What’s Left In Your Freezer? =-. Getting started is the hardest part and I think it depends on your personality. Personally I can blast through a pile of stuff with monster truck force, but for my wife it’s very overwhelming to her. That reminds me I need to blast out the garage. Paul, what you’re decribing could be equally true of basements and garages. Storage space means we need to put stuff in them, and we could probably all do with less of it. Good tie in with home equity lines/debt consolidation. What you’ve described is the pattern I’d seen hundreds of times in my years in the mortgage business. There’s so much to be said for traveling light in life. Your right about the basements and garages, but I think they key difference is that you are now expanding and are willing to pay for extra space monthly when you go for the storage unit. Next thing you know you’ll be firing up the money merge account. You’ve got some great points. I was encouraged to see you also had some exceptions. 🙂 Another exception would be those of us in the Sandwich Generation, who may be helping elderly parents, grandchildren, etc. Sometimes that involves helping others with storage. Sometimes it may involve moving, permanently or for a long-term period, to help. Each of those occasions can require a storage unit. Yup, I have one. And I really do need to sort out and toss some, but not yet… This will be a good reminder to me, though, to keep that on my to do list. 🙂 Thanks! In your face! I LOVE straight-forward, raw truth. It’s why I like Dave Ramsey so much. Haha! I love it Paul, in fact I feel the exact same way, but like you, am guilty of both. Having a storage unit is kind of like having a gym membership but never going. LOL I say that from experience btw. It feels like I would be better served to throw my money out the window as I drive down the interstate. Great post Paul! This is definitely my NEW FAVORITE post! .-= Brad´s last blog ..Lifestyle Design And Debt Freedom Go Hand And Hand =-. This reminds me of when we moved into our new house 3 years ago. We sold our old townhouse and put everything we didn’t need every day in a storage locker. The funny thing is – all that stuff sat there for 3-4 months, and we never touched it or needed it. Just goes to show just how little we need so many of the things/possessions that we amass over the years. Goodwill, here we come! .-= Peter´s last blog ..3 Reasons Why A Big Income Tax Refund Is A Horrible Thing =-. I’m 100% with you if you’ve got the contents of junk drawers in your storage unit you’ve got a problem. But there are times when storage units can be useful and the right thing to do. My wife and I used one when we were selling our house. We took A LOT of knick-knacks and smaller pieces of furniture out of our house for staging purposes and kept it in storage for our eventual move. I couldn’t wait to empty that sucker and cancel the storage agreement once we moved! .-= Joe´s last blog ..How Important Is Your Credit Score, Really? =-. Hehe, don’t tell anyone but we’ve got some foosball tables down in our parking garage for just such an occasion. Back in 2001 I was attending several auctions to buy cheap networking gear for my then employer and the auctioneer always commented that everyone of these auction lots included a foosball table. Something to think about in your own startup :-). As Kevin said, this applies to one’s own Basement as well. I found I was accumulating scraps of wood (I wood be JoeWoodworker in another life) to the point where it was beyond reason. I realized I had $10,000 worth of floor space being used by $50 worth of wood. I started to just burn it all as kindling. Little scraps are rarely useful, and just take up space. Starting to clear out the boxes of old magazines and memorabilia as well. Turning the basement into a useful area. .-= JoeTaxpayer´s last blog ..The Naughty Double Ohs =-. Into the JoeTaxpayer man cave? I have purchased woodworking tools that I don’t have room to set up because of the piles of wood scraps I “might need” one of these days. Instead of dealing with it, I tend to just avoid my basement. I need to follow your lead and start burning stuff. .-= Joe Plemon´s last blog ..Budgeting Without Bean Counting”¦5 Great Tips =-. See I was clever and built a dedicated “workshop” with a loft that was designed just to hold wood. If that sucker ever caught fire though it would burn for days. 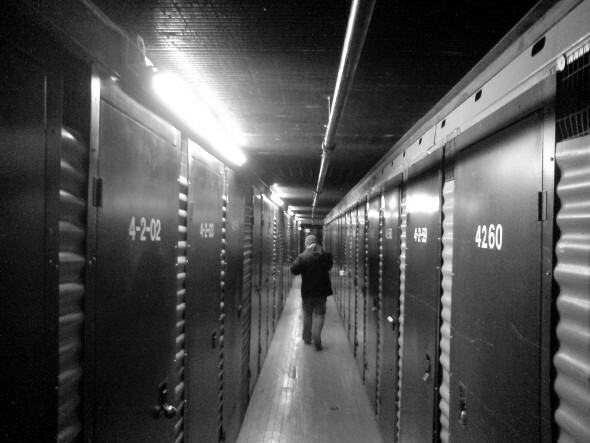 Storage is just a repository of lost dreams. See: Your half-built model train set. I just moved a bunch more of my junk into basement this past week. I’m doing a yard sale in the spring…no stopping me. .-= Ken´s last blog ..experiment =-. The only storage we ever had was to hold stuff removed from our house while listed for sale, simply to make it look more spacious. The benefit was we learned that much of this “stuff” we really didn’t need and most ended up donated to charity! Sounds like there is a recurring theme on this blog. PF bloggers are also woodworkers. Maybe we should have a Personal Finance Woodworker’s carnival? .-= LeanLifeCoach´s last blog ..We Canceled My Wife’s Life Insurance =-. I’m a former packrat who decided to move into an RV. One of my rules for doing this was that I wasn’t going to store anything in case my decision didn’t work out. I even wrote a book about the process, which inspired a fellow RVer whose storage unit was sucking him dry to deal with the unit once and for all. Really, folks, how much stuff do you need? If Self Storage is a drug, then I was raised by drug dealers! Oh my God! Haha, seeing a lot of this first hand its shocking to see what people store. A lot of businesses rent from my parents, such as law firms, landscaping companies, etc… but there are a select few customers who rent up to 7 units at a time just to store their “stuff” cause they can’t get rid of it. We’ve also had to deal with people living in the units, drug dealers, and loads of stolen goods. A storage garage is a perfect spot to store all your secrets without anyone knowing, including your addiction to stuff. .-= Ryan @ Planting Dollars´s last blog ..The Part Time Job Search =-. Ha that’s hilarious. I bet you have some stories to tell. I think I see the seeds of a new reality TV show. Very interesting analogy — the storage unit and the consolidation loan — probably, the consol loan is paying for the stuff in the unit! I personally don’t think that there is very much of an issue with storage versus living spaces these days. There are so many options for dual-purpose furniture or external storage suppliers that people are spoilt for choice if they want to own more things while keeping their homes stylish and neat!